You are going to need a really good punch recipe to play Guess the Ingredients. I have included my favorite recipe with the instructions. Guess the Ingredients is a game where you guess what's in the punch! Make the punch before the quests arrive and be sure to hide the trash can so they can't get any clues from there. Let each guest drink the punch and write a list of all the ingredients they believe are inside. I have provided some cards you can use for this purpose. The link is above in the equipment list. Subtract one point for every wrong ingredient listed on the card and give one point for every correct ingredient. 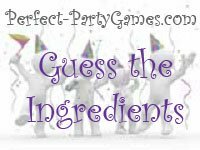 The player who has the most correct list of ingredients is the winner. Empty the frozen juices, pineapple and cranberry juice and water into large container or bowl. Thaw; stir well. Pour the mixture into punch bowl. Add ice cubes. Just before serving, gently pour in the ginger ale and soda water. Makes about 30 servings.